Looking for a cute ecard, Schnauzer style for family and friends? If so, we have 36 Miniature Schnauzer inspired ecards available for you here to do just that. Send as many as you like... as often as you like... because they're always FREE! 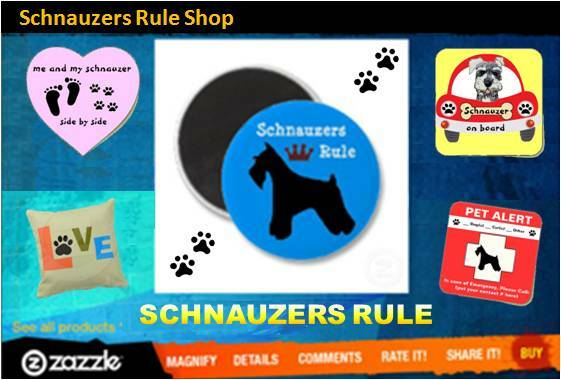 Soon enough, everyone will know that Schnauzers Rule! Aroo! Wouldn't you like to brighten up someone's day and make them feel special? Perhaps a family member, co-worker, or friend? You can do just that by sending them one of our adorable Miniature Schnauzer email cards. We have a nice assortment of cards showcasing the Schnauzer for you to choose from including funny cards, inspiring cards, and cards for special holiday events. Maybe you have a close friend that could use some words of encouragement; Or a family member that is celebrating a birthday; Or a co-worker who is about to retire. No matter what the occasion one thing's for sure... they will appreciate your thoughtfulness and kindness. Note: We no longer offer a service to send ecards from this site. You may, however, copy and save one of our designs to email your family and friends. Locate the card you would like to send someone by visiting one of the 3 pages below. We have a total of 36 Miniature Schnauzer cards (12 choices on each page). Check out the free dog ecard titles below to help you locate the page of the card you would like to send. Then click on the link. This group offers a variety of free dog ecards to help you keep in touch with people you care about. Whether you just want to send someone a Hello, Wish them a Happy Birthday, or let them know your thoughts are with them during a loss of a beloved companion. Simply choose a card from this page and then personalize it with your own message. This group of free dog ecards offers a great variety for some of life's milestones as well as inspirations. You're sure to find one that will represent your personal message perfectly. Click on the link above to choose a card to send someone special during the holidays. Click on the link that says Print-friendly version. That opens the card onto a clean page in your browser. Locate the menu for your browser. For instance if you are using Firefox, there is an orange Firefox tab at the upper left corner. Click it and a drop down menu will appear. From the drop down menu, click on the word Print. A box will pop up when you click on Print. Click on the button that says "OK" and your printer will start printing out the page.